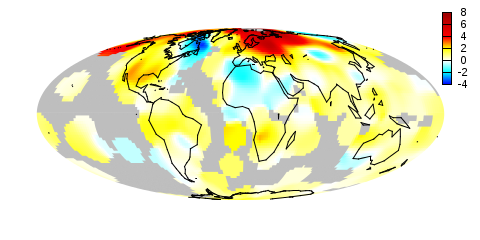 In one post we have used the parametric plot option to plot the world. 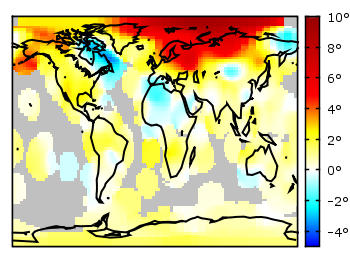 Here we want to add some temperature data as a heat map to the world plots. The data show the temperature anomalies of the year 2005 in comparison to the baseline 1951-1980 and is part of the GISTEMP data set. 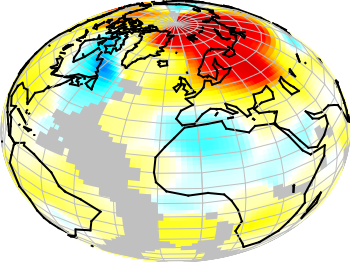 The first problem you face, if you want to create a heat map, is that the data has to be in a specific format shown in the Gnuplot example page for heat maps. Therefore we first arrange the data and end up with this temperature anomalies file. Unknown data points are given by 9999.0. The trick with the wide range from 0 to 101 for the color bar is chosen in order to use grey for the undefined values (9999.0) without seeing the grey color in the color bar. The result is shown in Fig. 1. The same data can easily be applied to the 3D plot of the world. We have to add front to the hidden3d command in order to make the black world lines visible. In addition the radius must be given explicitly as third column to the plot command for the temperature data. I’m very interested in heat map using pm3d. And I tried to make another one. An example script producing Mollweide’s projection map is shown bellow. In this script, q(t,x,dx,n) solves nonlinear equation of auxiliary angle by using Newton-Raphson method. set style line 112 lt 0 lw 0.5 lc rgb "#006600"
(th=q(pi*sin($2/180*pi),2*asin($2/90),3e-14,10),($1/90)*cos(th)): (sin(th)):(2)  w lines lc rgb "black"
I was wondering whether the same type of colour-coded parametric surface can be obtained for an analytic function? However, in gnuplot 4.6-0 I am having bugs in the hidden3d rendering (surface at the back is over the one at the front in places), which I don’t get with a non-colour-coded plot. Any thoughts or should I report a bug? Mh, strange. Maybe you try this first with the newest version of gnuplot and then report a bug. do you have an example of Gnuplot heatmaps that resemble something shown here https://learnr.wordpress.com/2010/01/26/ggplot2-quick-heatmap-plotting/ ? It seems unreasonably complex to realise something like that, but still..